Dr Lisa Searle, from Huonville, Tasmania, has done four assignments with Médecins Sans Frontières (MSF). She recently returned from Baraka, Democratic Republic of Congo (DRC), where our teams provide medical care to people amongst conflict and insecurity. What led you to work with MSF? I have wanted to work with MSF ever since learning about the organisation in high school French class. Something inside me clicked: I thought, “That’s it, that’s what I want to do with my life”. I was 15 at the time and had always felt incredibly lucky to have the opportunities I did growing up, being acutely aware of the suffering going on in the world. I did everything I could to gain the skills I needed. I did work experience in Thailand and the Philippines, volunteered in Tanzania, completed medical school and post-graduate work (including a Diploma in Obstetrics), and applied to MSF as soon as I possibly could. It was 10 years between the seed being planted and the adventure finally starting, and it was such an amazing feeling to have made it. You’ve just returned from a field assignment in Baraka, DRC. What is MSF doing there? 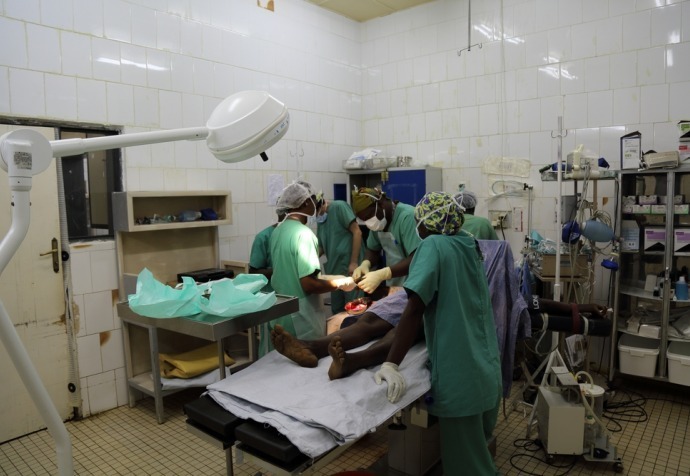 MSF first opened a hospital in Baraka in 2003, to provide medical care to the community amongst high levels of fighting and insecurity. There is still a huge need for our presence in the area 15 years later, as insecurity continues, government health facilities don’t have the capacity to fulfil all the medical needs, and the health problems are so complex and widespread. What did your role in the project involve? As part of the hospital management team, I oversaw the medical activities in the hospital and worked with the Congolese Ministry of Health and MSF doctors to try to improve the quality of care, ensuring protocols were followed and analysing mortalities and incidents in the hospital. Working with the Ministry of Health was sometimes challenging, but it is critical to strengthening the health system for when our teams need to leave. I was also responsible for medical supply and international medical orders. I assessed patients for potential transfer to a larger referral hospital and organised these transfers when necessary, and I worked closely with the rest of the management team and the medical coordination team to constantly analyse our activities and disease patterns to assess our progress. What stands out for you from your time in Baraka? Although I have spent a lot of time in Africa and Asia in countries where malaria is present, the incidence of malaria in Baraka shocked me. In the peak malaria season (the rainy season), we received an average of 100 admissions to the hospital every day, and the vast majority of these cases were children with malaria. It is scary how quickly the disease can progress, and how rapidly children can develop complications – devastatingly often, these children arrive at the hospital too late for us to save them. What did you find the most rewarding part of this assignment? The most rewarding thing for me is always the patients: the ones we can save, the lives we improve, and seeing the smiles on the faces of mothers taking their children home after they have been so sick. They are so grateful for our help and it is humbling to be able to affect peoples’ lives in such a profound way. While I was in Baraka we organised a plastic surgery team to come to the capital, Bukavu, to provide free repair of cleft lips and palates, and I spent a lot of time working with our community outreach team to locate kids in the community who would benefit. We organised transport for around 20 kids. It was amazing to see their gorgeous new smiles after the surgery, and incredible to be able to make such a difference in their lives. What advice would you give to other doctors considering this work? Do it! You will be thrown in the deep end, out of your comfort zone in so many ways, you will see things you never imagined, you will be tested to your limits, you will find strength in yourself that you never knew you had. You will change peoples’ lives and have experiences so few people ever get the opportunity to have. It is difficult, but the rewards are amazing.